^ Van Helden, Albert. The Telescope in the Seventeenth Century. Isis (The University of Chicago Press on behalf of The History of Science Society). March 1974, 65 (1): 38–58. JSTOR 228880. doi:10.1086/351216. ^ Satellites of Jupiter. The Galileo Project. Rice University. 1995 [9 August 2007]. ^ Annuaire de l'Observatoire royal de Bruxelles - Google Boeken. Books.google.com. [11 November 2013]. 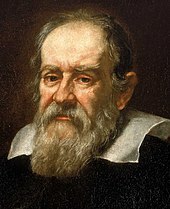 ^ 8.0 8.1 Marazzini, C. The names of the satellites of Jupiter: from Galileo to Simon Marius. Lettere Italiane. 2005, 57 (3): 391–407. ISSN 0024-1334 （意大利语）. 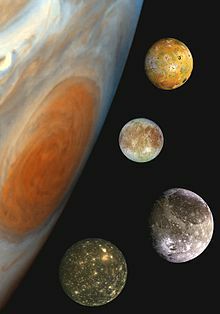 ^ Marazzini, C. The names of the satellites of Jupiter: from Galileo to Simon Marius. Lettere Italiana. 2005, 57 (3): 391–407. ^ Schenk, P.; 等. The Mountains of Io: Global and Geological Perspectives from Voyager and Galileo. Journal of Geophysical Research. 2001, 106 (E12): 33201–33222. Bibcode:2001JGR...10633201S. doi:10.1029/2000JE001408. ^ High Tide on Europa. SPACE.com. [2007-12-07]. ^ Freeman, J. Non-Newtonian stagnant lid convection and the thermal evolution of Ganymede and Callisto (PDF). Planetary and Space Science. 2006, 54: 2–14. doi:10.1016/j.pss.2005.10.003. （原始内容 (pdf)存档于2007-08-24）. ^ Chown, Marcus. Cannibalistic Jupiter ate its early moons. New Scientist. 7 March 2009 [18 March 2009]. ^ Computed from IAG Travaux 2001. ^ Mike Brown, How many dwarf planets are there in the outer solar system? ^ Yeomans, Donald K. Planetary Satellite Physical Parameters. JPL Solar System Dynamics. 2006-07-13 [2008-08-23].